Like moths seeking illuminated warmth, pilots are genetically drawn to aviation accident reports. Most say they pore over them to perhaps discern details that might keep them from ending up as the subject of their own accident report. As they read, I’m sure many have unspoken, fleeting thoughts similar to mine…Facing the same situation, I’D never do that! Such thoughts are easy when reading the detail of an accident because we hear them in our individual intracranial echo chambers. Unless we’ve faced impeding doom, I’m sure the voices that play the different roles carry none of the original emotion, especially when reading the transcripts from a cockpit voice recorder, which by its phonetic initials is Charlie Victor Romeo, the title of a new 3D adaptation of a play first staged in 1999. The film is now playing in New York and LA. It is listed on Netflix but is not yet available. After watching the trailers, which focuses on a snippet of the DC-10 arrival at Sioux City, one of the six airline accident CVR recitations, I’m not sure I want to. The presentation is all too real because the actors perfectly embody the focused and controlled pilot voice Tom Wolfe wrote about in the opening pages of The Right Stuff. This entry was posted on Monday, February 10th, 2014 at 12:45 am	and is filed under Airline Pilot, Airlines, Blogging, Business Aviation, Flight Training, General, Military. You can follow any responses to this entry through the RSS 2.0 feed. Both comments and pings are currently closed. I agree pilots read accident reports to learn and we sometimes think “I would never do that”. But I must say that I have had several things happen that I had read about in an accident report. Having read the report greatly help me be prepared to handle the issue. A prime example is when I took off in a 172 and at about 50′ the pilot side window flew open. I also had a door open in a Bonanza A36 shortly after takeoff. Both were a surprise and very loud. But I remembered reading about these in accident reports. I continued to gain altitude and did not try to immediately fix the issue. When I believed I was ready, I closed the window. For the A36, you can not close it in the air and so I landed to close it. I have had other things like this happen in my flying career and thanks to these reports, I am better equipped to handle them. I was one of the first persons to review the original off-Broadway play (http://www.avweb.com/news/reviews/181953-1.html?redirected=1) in 1999. Being a pilot and aerospace engineer, I was quite skeptical about the accuracy of portraying aviation in a stage setting. But as my review notes, the producers and actors did a very credible job of recreating the tense circumstances leading up to each of these real-life aviation accidents. I just hope the movie is as gripping and realistic as the original stage production, and I look forward to seeing the film version. While in flight training via Utah Valley University’s online based Aviation Science Bachelor’s Degree program, the emphasis on reading NTSB accident reports and then writing our own evaluation of the findings instills in your mind “it CAN happen to me” solidifies personal evaluation checklists pre, flight, and post. Yet, I still read of fatal accidents by those who would have probably written the same as I have just written, if only they were still around to say so! Charlie Victor Romeo’s theatrical performance has certainly evolved over the last 15 years… if anything, getting more realistic. That’s what you get when your play receives notes from the audience after every performance. In this case those notes are usually in the form of crew pointing out that the Autopilot Instrumentation on that specific model of 757 would be located in such-n-such quadrant of the dashboard and so that’s where you should reach at that moment. Also the set we have been using since ’00 was constructed partly out of DC-10 parts we picked up at the Mojave Airport junkyard ;-). Your review was the first review that we received from any aviation related press… and it’s been proudly featured on our website ever since. The ongoing interest and support of the aviation community has been our Avgas. The film was shot in stereoscopic 3D of the theatrical piece in front of live audiences. Our goal was to capture what we do as best we can and bring that powerful experience to the larger audience that wants to interact with it. Reel Stuff Aviation Resources represents CVR for “non theatrical” bookings such as safety seminars and conferences (and not just for aviation professionals and students, but also those in the medical/healthcare industry). Such screening packages include Bob and Patrick Daniels’ outstanding and insightful intro of the film and leading the always lively post-screening audience conversation. I know from experience – the first time I saw CVR 3D was their presentation of it at 2013 Safecon during the NIFA championships in Columbus last summer. Both students and veteran instructors clearly were profoundly affected, in a positive way. An info sheet PDF is available at http://www.reelstufffilmfest.com. Feel free to contact me at Reel Stuff Aviation Resources [director@reelstufffilmfest.com]. Hopefully CVR will soon be a staple of the major safety gatherings soon. Thanks for your great coverage. 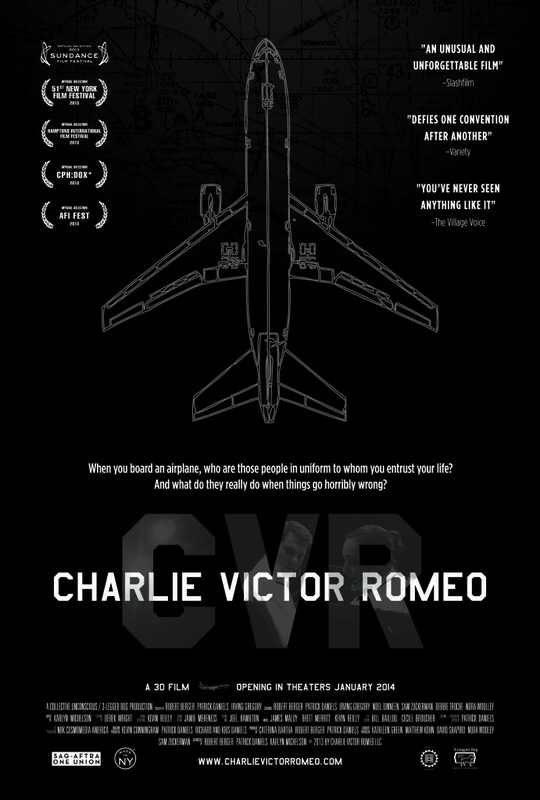 Thank you so much… get on our mailing list @ http://www.charlievictorromeo.com and as soon as we announce screenings you’ll hear about it… we’re also on the Facebook @ https://www.facebook.com/CharlieVictorRomeo and we post news there as well. We will be announcing more screenings soon.